The Truly Real Human Female. Last Saturday evening, a late night installment of the sixth annual Solo Performance Festival featured burlesque for the first time. The event was Cherry Manhattan’s The Beyond Real Human Female and included performers Fuchsia FoXXX, Jesse Belle-Jones, and Diva le Déviant as well as the producer herself in a slow-burning diptych. Promotional materials touting the promise that The Beyond Real Human Female would “[play] with expectation, form, gender and the body politic in the true spirit of burlesque as a transgressive and transcendent space” left me dubious, as so often I have witnessed a burlesque exploration of sociopolitical ideals fall terribly short. Although setting an incredibly high bar for themselves artistically, viewing the first half of the show with the understanding that these performers were acting with specific intentionality prompted more intellectual participation. What may have come off as at times mediocre was transformed by the lens through which I was viewing the performance, and the statement of purpose was what unified these acts. This purpose was also particularly capable of transcending the now (unfairly) dreaded cabaret format and effectively engaging the audience. After a brief preface from Ms. Manhattan and an introduction by “feMC” Diva le Déviant, Fuchsia Foxxx opened with her high glamour, instantly recognizable style of bellydance. It was particularly recognizable as I had, in fact, seen the number on several occasions previously. 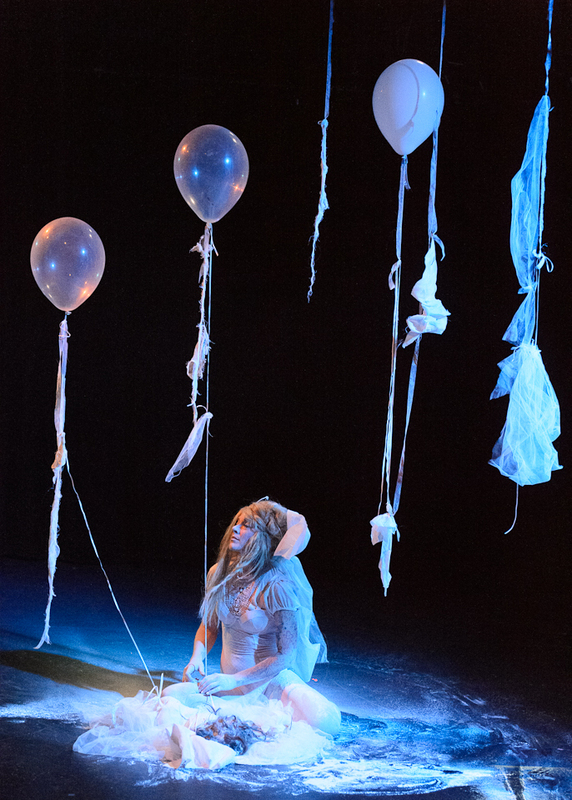 From Fuchsia’s performance on I began to reflect on the significance of burlesque performers at a “solo performance festival.” From the beginning, burlesque has been notably do-it-yourself and as a performer, one becomes a multifaceted marketing machine. The catch being you are the commodity you are attempting to sell. Online and in person, burlesque performers are often obligated to manifest an image and brand that patrons can immediately associate with the individual; the payoffs of achieving this recognition successfully are the patron’s dollars and a positive professional reputation, which in turn opens the door to further creative endeavors. So one is selling oneself to patrons and to producers, but the name being advertised isn’t yours. The history and backstory of your brand are not yours, and rarely do the hairs on your head- nor your long black lashes- actually belong to your body. But all of these descriptors, these tiny details comprising a whole, are meticulously plucked from one’s own experience. Within all myths are shards of truth. The Beyond Real Human Female attempts to dissect what Reality looks like for the individual performer and the thread-thin line we trudge as artists between what materially exists and what we create with our minds. This notion of the individual experience carried with me through the first act with Jesse Belle-Jones providing a stunning performance in another familiar number that seems to exponentially increase in entertainment value with each viewing. 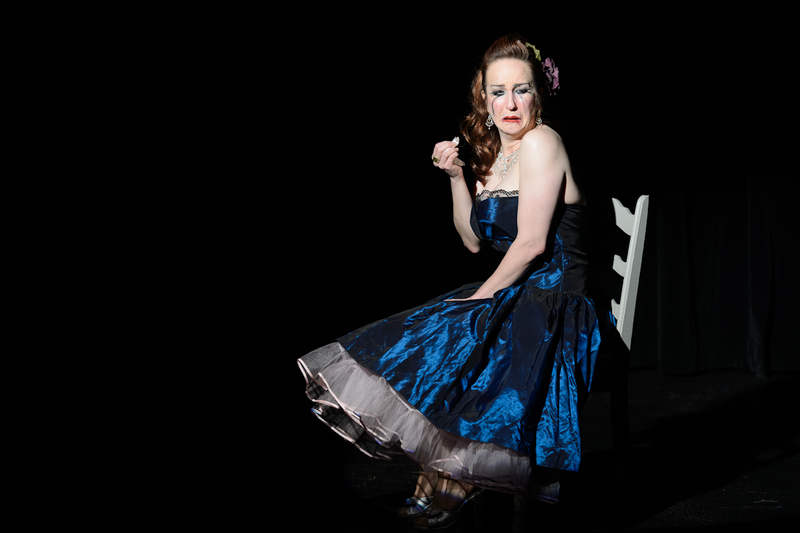 Cherry Manhattan presented an insidiously cute vignette of unrequited love. We were brought back from a brief intermission with a jolting video installment presented by Diva le Déviant (known at this point as one of her three alter egos, Daddy le Déviant). A stomach-churning survey of news and media footage featuring the recent onslaught of political attacks on women’s rights segued into the conclusion of what we found out to be Cherry’s joke on us. With the reuse of music from her previous number (standard tricks of the tease) and uncontrollable sobbing, Ms. Manhattan managed to make me feel spectacularly uncomfortable as a viewer, a discomfort emphasized further by the inappropriate hooting and hollering of an older gentleman in the front row (an incident that led my date to ask me if perhaps the catcalling had been staged). Both Jesse and Fuchsia’s final performances perpetuated this eeriness. Fuchsia’s second offering in particular- a stark contrast to her opening act- featured some of the most prominent female musicians of my own adolescence. Although rarely heard in the burlesque circuit, the music’s connotations to feminine loneliness, self-discovery, and exploration are impervious to debate. Refreshingly, the second act presents neither obligatory happy ending nor cliché orgasmic trope. What The Beyond Real Human Female provides in the end is a forum for a group of complex, imperfect, and truly real human women to create art from the place their characters originate: their souls. Ideally such work can exist outside of a specifically curated two-night run, and hopefully the curatorial organization and emotional reveal seen at Theatre Off Jackson this weekend will inspire others to follow suit. The Beyond Real Human Female will show once more this Saturday, April 28th, at 9:30pm at Theatre Off Jackson. For more information and tickets please click HERE. You can find additional profiles of the women behind The Beyond Real Human Female on photographer LaRae Lobdell’s blog, www.photosister.com. ~ by angrytruffle on 04/26/2012.